Mittal Steel, the world's largest steelmaker, has made an 18.6bn euros (£12.7bn) bid for rival firm Arcelor. 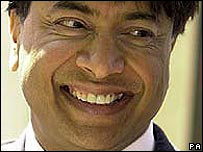 Mittal is headed by Lakshmi Mittal, one of the UK's richest men with an estimated fortune of more than £15bn. Arcelor shares rose more than 30% after Mittal Steel said it would offer 28.21 euros a share for the Luxembourg firm and would seek talks on a deal. Arcelor described the bid as "hostile" but said it would not take any action until its directors meet on Sunday. "Arcelor underlines the hostile nature of this move, that takes place without prior discussions or consultations between both companies," the company said in a statement. The bid comes as the steel industry is consolidating rapidly amid a fall in steel prices from their 2005 highs. Prices rose rapidly in 2003 and 2004 but have slipped recently as demand for steel from China has cooled slightly. Arcelor recently won a fierce bid battle to acquire Canadian firm Dofasco for 3.95bn euros (£2.7bn) although Mittal Steel intends to sell Dofasco if its bid proves successful. If approved by Arcelor investors, the deal would create a giant steel firm with more than 250,000 employees and revenues in excess of $50bn. 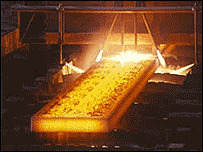 It would produce about 10% of the world's total steel output. However, the deal is likely to face scrutiny from the European Commission and other competition authorities. "We believe the offer provides a very attractive premium and has been structured so that Arcelor shareholders have the opportunity to participate in the exciting growth potential of the combined company," said Mr Mittal, the firm's chairman and chief executive. Mittal Steel, which has headquarters in London and Rotterdam, was created in 2004 by the merger of three leading operators. It has expanded rapidly since then, buying Ukraine's largest steel mill last year for £2.7bn and investing heavily in India. It now operates in 14 countries. Arcelor, for its part, has a presence in 60 countries and is market leader in Europe and Latin America. Mr Mittal has hit the headlines in the past for making large donations to the Labour Party in the United Kingdom. He gave £2m to Labour in July, one of its single largest-ever donations, following its third successive election victory. Mittal Steel's shares rose 6.4% on the news of the bid.